Step 1 Place the apple stem side up and cut downward, from stem end to root, into quarters. Discard the core. Cut each slice into thin strips about 1/2-inch wide, then cut long strips in half crosswise. Step 2 Peel the carrot and cut in half crosswise. Cut each half lengthwise into 5 slices. Cut each slice lengthwise into 4 slices. Step 3Wash the spinach thoroughly. Cut off the stems. Cut each leaf into quarters. Step 4Combine the apple, carrot, onion, tomatoes and spinach in a bowl. Step 5Mix the balsamic vinegar, honey and oil. Season the dressing to taste with salt, pepper and oregano. Add enough dressing to coat the salad ingredients, mixing carefully. Test for seasoning. Divide the salad among 3 plates. Crumble goat cheese over each salad. In Recipes-list.com we have selected the most viewed recipes from category - Appetizers Salads . Enjoy the best recipes specially selected for you! 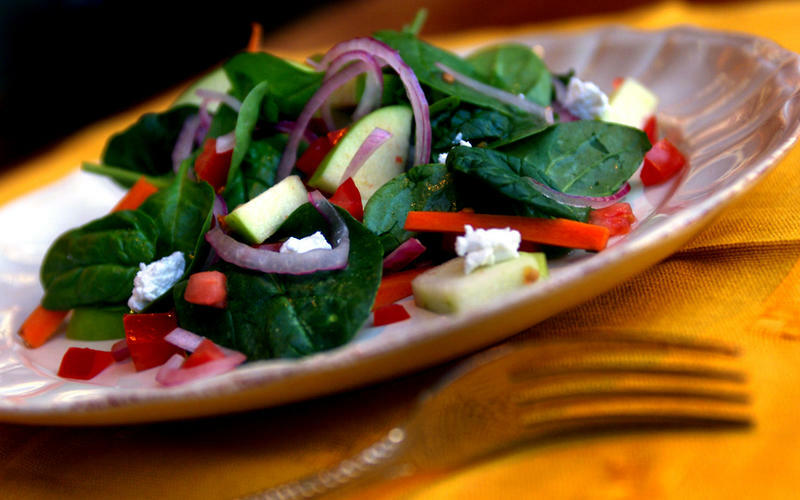 Apple and Spinach Salad (Ensalada de Manzana y Espinaca) is the right choice that will satisfy all your claims.